One of the key defensive measures when it comes to preventing pollution are spill kits, however it is equally important to have well trained first responders. As well as understanding how to use spill kits it is also important for staff to have the environmental awareness to understand why preventing spills from impacting the environment is so important. For organisations with a large work force, or for organisations where due to shift patterns etc. it would take a large number of sessions to train all relevant staff on spill response, a train the trainer course may be a more cost effective way of rolling out competent spill response training. On a train the trainer course we train key personnel to deliver spill response training so that they can distribute it throughout your workforce. Personnel who typically attend the train the trainer course are Environmental Managers, Health and Safety Managers, Internal Trainers and Team Leaders. Your Environmental policy and why delegates are expected to protect the environment. What dangers you have on site and how they can harm individuals and the environment. Overview of EA’s “Pollution Prevention Pays” including video. Summary of legislation and best practise guidelines. Case studies of spills leading to environmental damage and prosecutions. Staying safe in a spill event, choosing PPE/RPE and consulting MSDS’s. Reporting procedures in the event of a spill EA and sewerage undertaker. Actions to be taken in the event of a spill (including spill simulation video). 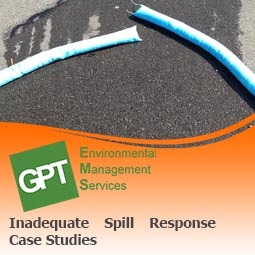 Work through your spill response procedures. “Dry” classroom demonstration of products contained in spill kits. Practical demonstration of Spill Kit cleaning up real spill. Our spill training is made bespoke to your needs and will be tailored to include information regarding your site specific risks and the control measures you have in place. We have conducted training sessions for clients in all different sectors and understand the different risks our clients have e.g. Industrial sites which may use toxic substances like cyanide, caustic soda and hydrochloric acid.